Minimum weight. Maximum aerodynamics. Full comfort. 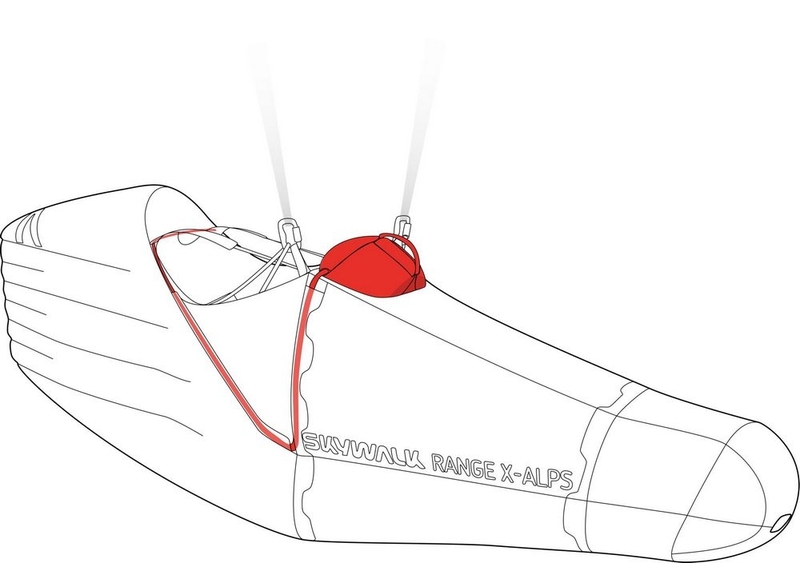 The RANGE X-ALPS2 is the first choice for Hike&Fly athletes and XC pilots who want to go to the limit in competitions or who insist on extremely light gear. Its detailed design is tailor-made for pilots looking for the ultimate, safe and amazingly comfortable harness for XC- and bivouac flights, when every gram counts. 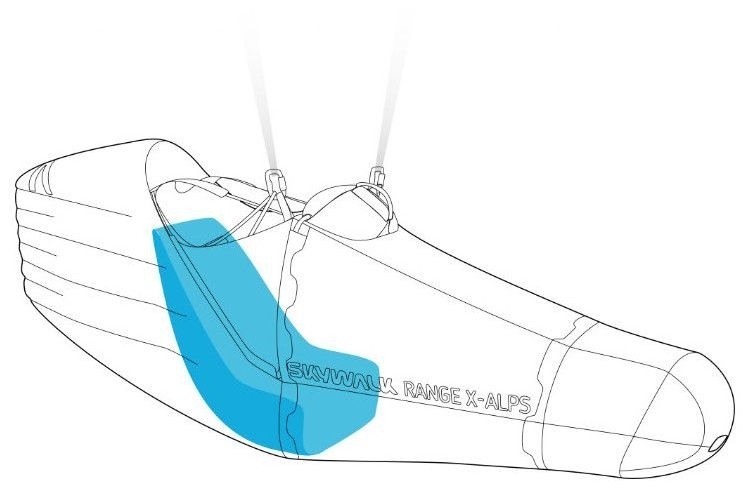 The RANGE X-ALPS2 meets the highest demands of top international athletes – such as Paul Guschlbauer, Simon Oberrauner and Ferdinand van Schelven in aerodynamics, weight and pack volume. Its ingenious design and many features ensure comfort and safety in flight so that you can concentrate on your next big goal. The Power Frame of the RANGE X-ALPS2 distributes the weight of the pilot and the applied forces evenly over the entire seat shell and offers optimal support without pressure points. The pilot sits stably, neutrally and comfortably and steers his paraglider intuitively, keeping an even keel even in turbulence. In the event of a collapse, he can sit up quickly and assume a compact body posture. 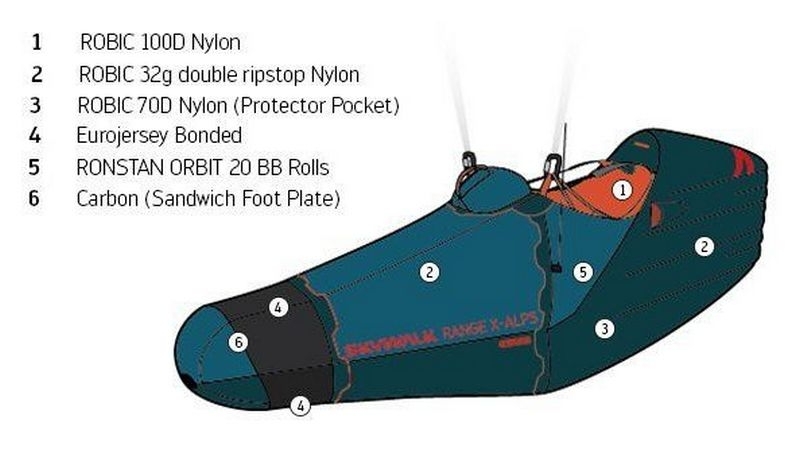 The second pioneering innovation is the PermAir protector. It combines the advantages of foam protectors with those of ram air protectors and offers high damping already during launch with a minimum packing volume. 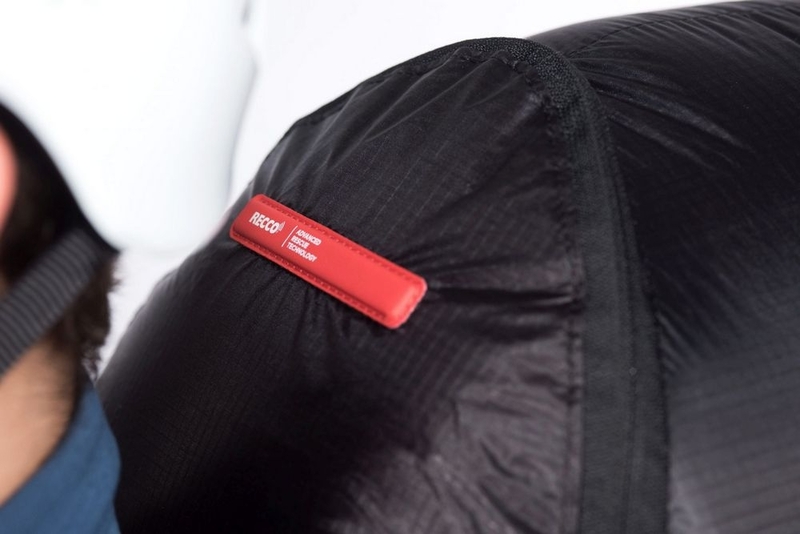 The airbag is inflated with the included Inflation Bag and protects your buttocks, back and lumbar vertebrae right from the start. After landing, just let the air out, collapse the harness in a few seconds down to the size of a towel, and stow it in the backpack. 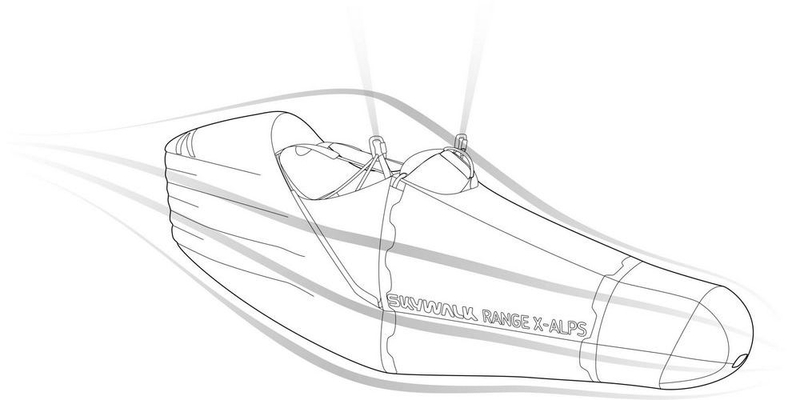 Our development team didn’t compromise comfort when developing the RANGE X-ALPS2. A simple two-way get-up system provides easy access, while easy-to-find adjustment straps allow you to adjust the backrest perfectly to your individual sitting position, even during flight. Combines the advantages of foam protectors with those of ram air protectors, offers high damping already during launch, minimum packing volume. >> The inflation bag is not only a carrying bag, it's also bellows. Once filled with air, the PermAir protector can be easily inflated by connecting the valve and pressing down. A breeze! Ensures ideal load distribution and support – highest flying comfort guaranteed! >> Our harnesses with Power Frame distribute the acting forces optimally to the pilot. Ideally, the pilot receives optimal support in every position, just like in a modern office chair. If the harness fits perfectly, he can control his glider intuitively even in turbulence. With our ultra-lightweight harness RANGE X-ALPS2, the Power Frame ensures that the seat shell perfectly encloses the pilot at all times. The most important component is a wafer-thin wire made of unbreakable spring steel. The harness can be folded super small due to its structure and therefore has a minimum pack size. >> Extremely light with minimal space: The RANGE X-ALPS2 meets both requirements with flying colors! 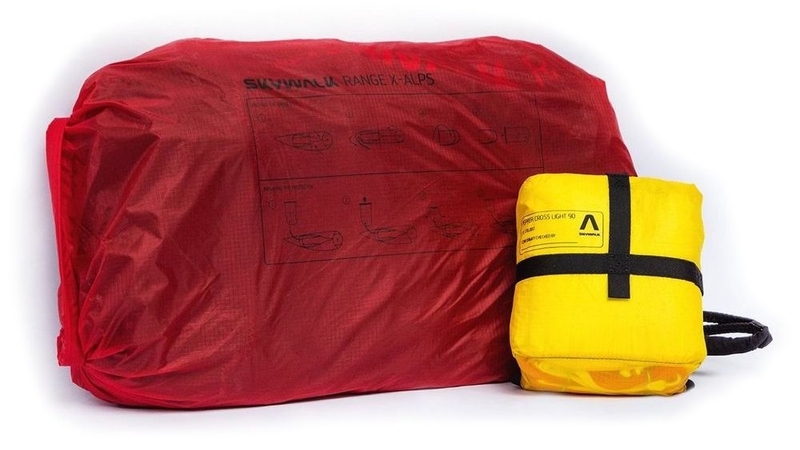 >> To save space and weight, let´s use the inflation bag to kill two birds with one stone: The bag serves both as carrying bag for the harness and as a bellows for the protector. This feature is unique and a milestone in harness development. The inflation bag can easily be filled with air by opening it. The tube of the PermAir protector can be attached to a valve located on the inflation bag. In addition, the inflation bag has a >>Roll Top<< that guarantees the ideal pack size. The rear compartment offers ample space for a rucksack and a hydration bag, while another storage compartment under the seat has room for a ballast bag or other equipment. Two inside pockets – left and right – are meant for camera, cereal bar and all the things the pilot needs during the flight. 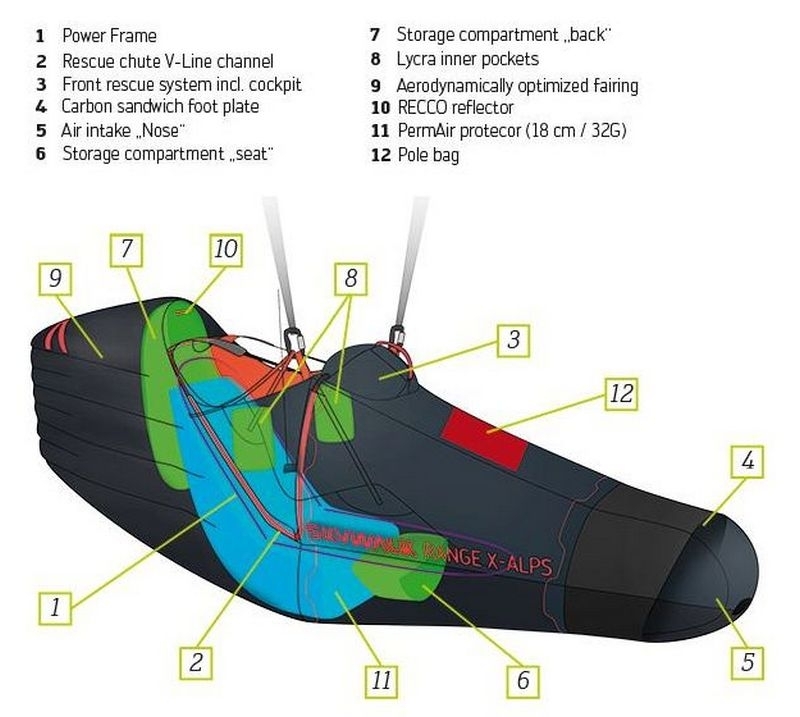 Another highlight is the pole bag, which is attached to the inside of the pod. It ensures a simple and safe stowing of hiking poles – this eliminates unpleasant pressure that can arise when stowing poles in the rear compartment. The front container is right in the pilots visual field. The cockpit provides enough room for several flight instruments. The rescue system is suspended on the shoulder strap. International standard: The RECCO®-Reflector accelerates rescue operations and helps to safe lives. The pilot accounts for a third of the total drag, so the performance with a harness with an upright sitting position can vary greatly from that of a harness with a recling position or a pod harness. Agility can be effected too – this depends on how high or low-slung the harness is. Whether the harness has a seatboard also plays a decisive role. 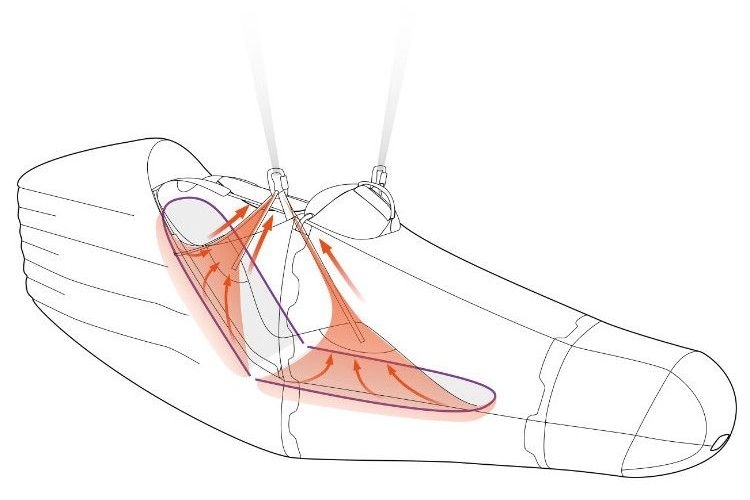 The sooner the leg straps of the Get-up system become taut, the faster the damping effect will set in. Since the POWER FRAME also ensures an even weight distribution under the seat surface of the RANGE X-ALPS2, you will not miss the bulky seat board. Instead, you will quickly learn to appreciate the advantages of the hammock principle. The length of the speed bar must be adjusted to your leg length. Both line, right and left, must have the same length. The speed bar on the RANGE X-ALPS2 comes already mounted and pre-set. Does the harness require any special handling? In general, extra care must be taken when handling the harness due to the lightweight materials used. The harness should be treated especially gently when donning and removing it. (The outer skin of the harness serves to improve the aerodynamics and is not part of the load test). For which target group is the harness suitable? 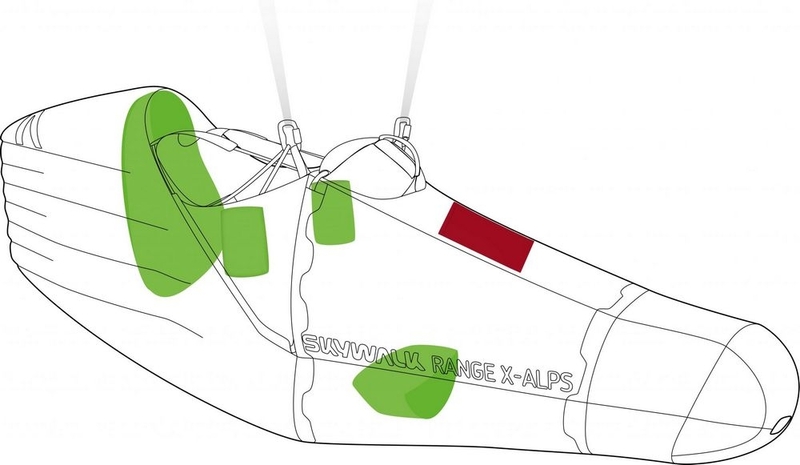 The harness is designed for the toughest adventure race in the world, the Red Bull X-Alps. It is suitable for pilots who are used to flying with a harness without a seat board, as well as for those who understand how to handle a lightweight harness. Compared to its predecessor, however, the RANGE X-ALPS2 is easier to handle. Thanks to its use of the latest technologies, it is more comfortable and easier to fly in the air. How much should the PermAir protector be inflated? The human lung can manage 0.2 bar on average. This pressure should not be exceeded. Make sure you close the tube in 3 seconds or less. If there is a large elevation difference between launch and landing sites, use the rule of thumb: PermAir max full! Can I change the chest strap setting on my RANGE X-ALPS2 harness? No – the chest strap is integrated in the support of the front mounted reserve container and foot pod. Shortening or lengthening it would either cause the reserve to sag inwards, or the pod fabric to become tensioned and possibly fail.